In a speech delivered in 1936, Prime Minister Mackenzie King famously declared, “If some countries have too much history, we have too much geography.” Canada is a relatively young country whose history is inextricably linked to those of countries an ocean away. So how do you try to capture a sense of the past through records when they are held in the archives and libraries of the United Kingdom and France, and how can these records be made available to Canadians? Jean-Baptiste-Louis Franquelin. CARTE DE L’ACADIE CONTENANT Tous les Ports, Havres, Sondes & Mouillages qui font le long de fes côtes; Les Bois, Montagnes, Lacs, & Marais qui font dans la profondeur de fes Terres & touttes les Rivierres qui en defcendent. Avec une partie de la Colonie Françoise du Canada audessus & dessous de Quebec sur les bords du Fleuve de St Laurent 1702. 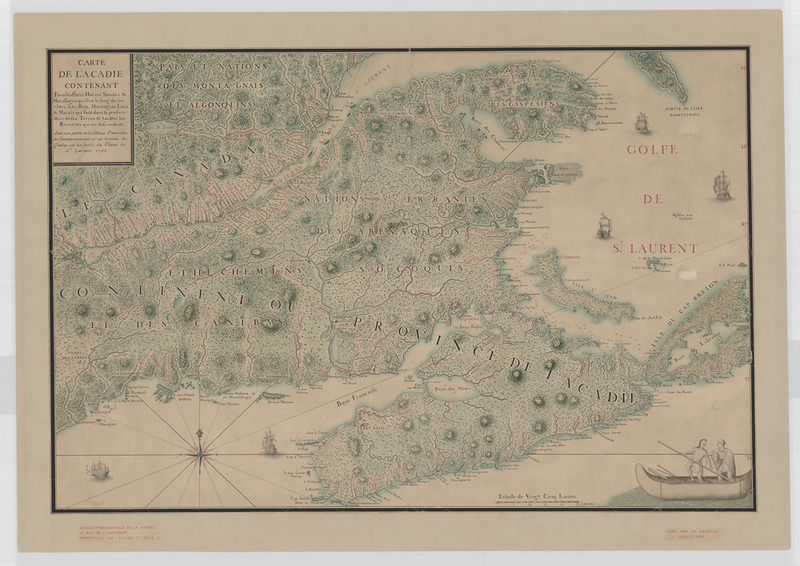 This map was originally produced by the official cartographer for New France, Jean-Baptiste-Louis Franquelin. The map is a copy made by Charles Beaudouin in July 1939. Artists were hired to copy important maps and plans from the archives of Great Britain and France. These maps and plans from LAC’s collection are considered to be originals (MIKAN 4125184). A concerted effort to document and promote our past started even before Confederation. Citizens and members of organizations like the Literary and Historical Society of Quebec (LHSQ) travelled to Europe to scour records in British and French archives for any mention of Canada. Even Louis-Joseph Papineau, while in exile in France following the Lower Canada Rebellion, identified and copied important records highlighting Canada’s colonial past. When the Dominion Archives was founded in 1872, research increased exponentially. By the time the first Dominion Archivist Douglas Brymner died in 1902, 3,000 volumes of transcriptions of records relating to Canada’s colonial history had been produced. In 1905, a permanent team responsible for the transcription of records was established in Europe. Brymner’s wish had been for Canada to possess those records that bore witness to vital moments in the country’s founding and administration by foreign powers. Over the next century, his vision was realized. The success of the copying program abroad was heavily influenced by events of the day. In the 1920s, the economic prosperity of Canada meant that copying increased dramatically because a larger number of copyists, such as locals, working or retired archivists, and Canadians abroad, could be hired. In the 1930s, the copying program shrank, and during the Second World War, copying in France ceased and all transcriptions that hadn’t been sent to Canada yet were kept in the care of the Swiss and American embassies in Paris throughout the war. With the introduction of microfilm and microphotography, the copying process became easier, faster, and more efficient. In a century, more than 450,000 pages were transcribed. From the time that microfilming was introduced in the 1950s to the end of the copying program at the beginning of the 21st century, approximately 2.5 million pages were microfilmed. Anonymous. Plan de l’enclose de Plaisance en Terre-Neuve [dessin d’architecture] : fait le 15 [septem]bre, 1690. 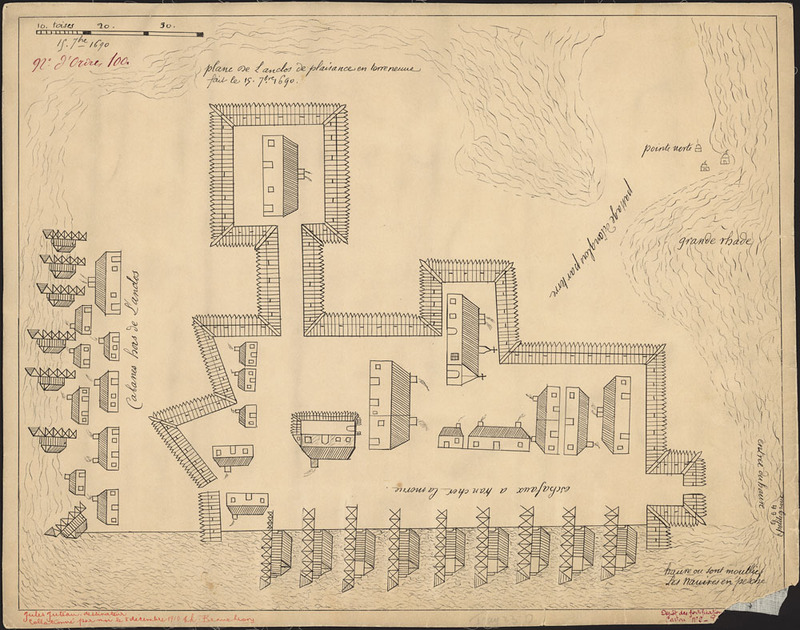 This plan of the settlement of Plaisance in Newfoundland from 1690 was copied by Jules Juteau. In the bottom left-hand corner, you can see the artist’s signature and notation of the date when it was completed (MIKAN 3941581). From the very first trip abroad by members of the LHSQ in 1835 to the end of LAC’s copying program in the early 2000s, copyists worked diligently in the archives and libraries of France and the United Kingdom to recover documents that help us better understand our past. Many of these copied items can be found on the Héritage website. This entry was posted in Our Collection and Facilities, Politics and Government by Library and Archives Canada Blog. Bookmark the permalink.